For many people a list of groceries to buy is important to have so they stay on budget, and also to figure the items that they need to stock up on. It is a convenient way to figure the costs for products you are buying whether single or in bulk. It can allow you to compare against other brands that sell the same items too. A handy way to do this is by using a grocery inventory list with a spreadsheet program. You can see how prices have changed, and how much you are spending for all items, and even where you are buying them. 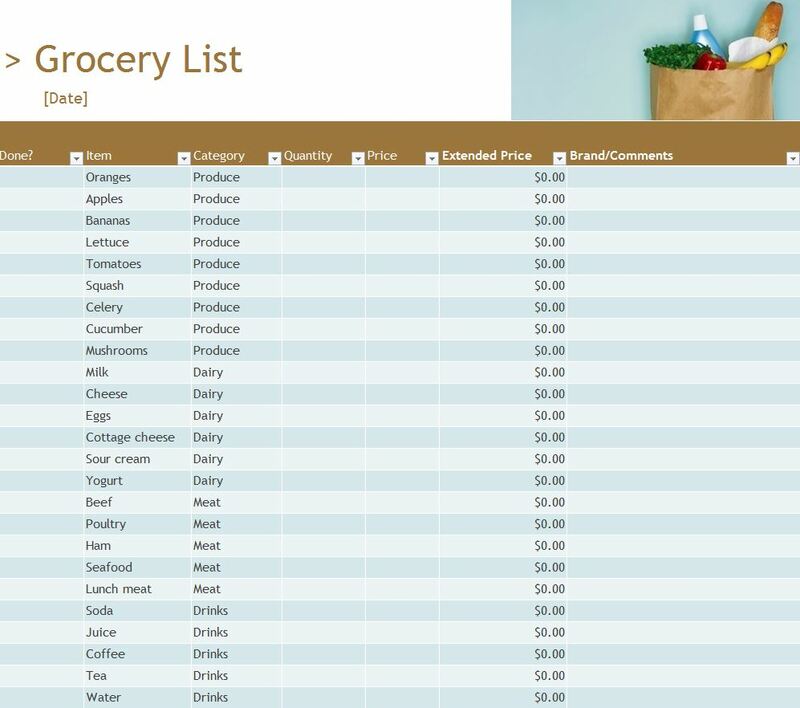 With the template available for free on this page, you can create a custom grocery list to manage your shopping. It is easy to use, and customize to your liking. Compatible with Microsoft Excel 2007 or later. Download the grocery inventory list to your computer and save to any folder you want or directly to the desktop. Find the file and open it to begin editing the list with your own details for items you buy. You will see a list for grocery store items that are common on most people’s list. Leave the ones you normally buy, and delete the items you do not. You can also add additional items to the list. The titles of the columns on the list include item (oranges, potatoes, milk, etc), category (produce, meat, dairy), quantity, price, and brand/comments. Edit them as you please to match your shopping needs. You can add a column to note down whether a coupon was used to save additional money on the item. This can keep you from wondering why the item was at a lower price during your last purchase. You can also use the grocery inventory list to compare the items to other brands or other stores nearby. Many times, people shop at several different stores near them to get the most savings. The grocery inventory list is helpful to print out and use when you go shopping. When you are done just enter the information on the spreadsheet if you have decided to save it on the computer. Download the template today for free.